Who replaced my babies with these teenagers?! 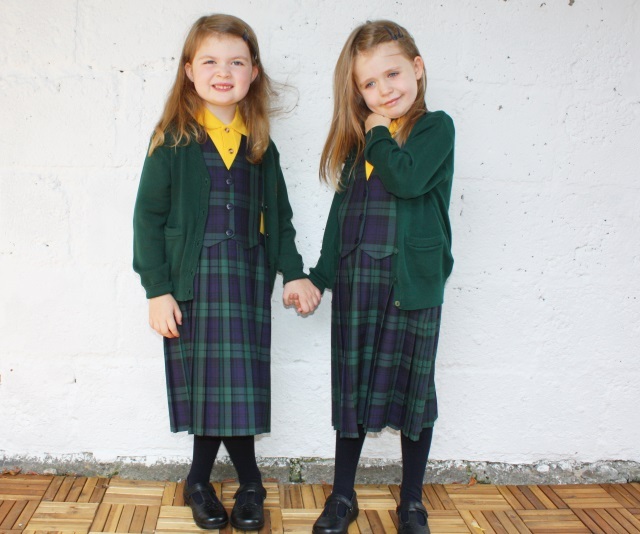 Lile and Sábha are entering the world of 'big school' before the end of the month. There is much excitement, a bit of apprehension and a lot of preparation involved. The uniforms have been bought, and hung carefully in the wardrobe. Not only is it strange to see them looking so grown up and proper schoolgirl-ish, it's also weird to see them in such sensible clothes. They usually choose to wear a colourful mish-mash of... well... everything... and don't often dress in matching outfits either. Seeing them so 'de-personalised' is a very new experience for us all. Having to wear a uniform doesn't mean there is no scope at all to show your personality in school, however. 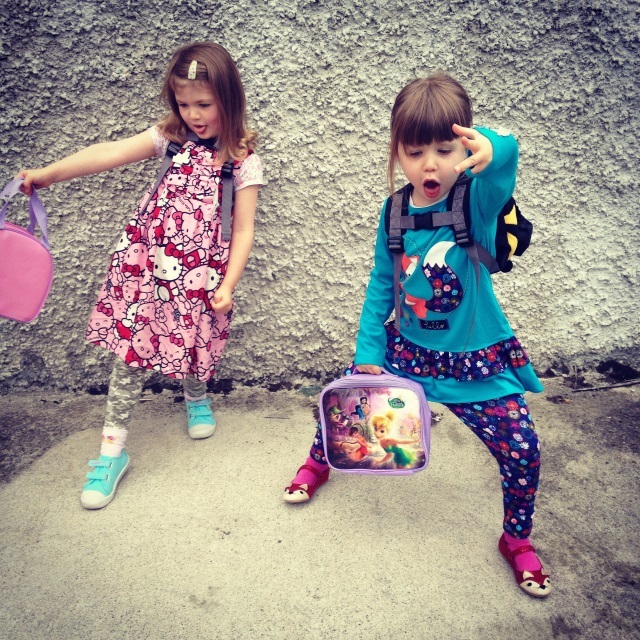 The easiest way to show your kids' personal style is probably with a cool choice of schoolbag or pencil case - but, as my girls don't even need those things until October (they like to ease the newbies in gently at their school) we've got to show our style with the only thing they'll need from day one - lunchboxes. Lile and Sábha had been eyeing up several 'character' lunchboxes over the past while - but weren't really taken with any of them. I was quite happy about this, because I think character-branded products date very quickly. The characters they like now will likely be out of favour by the end of the school year - if not the first week of school! - so I was hoping to find something more timeless. 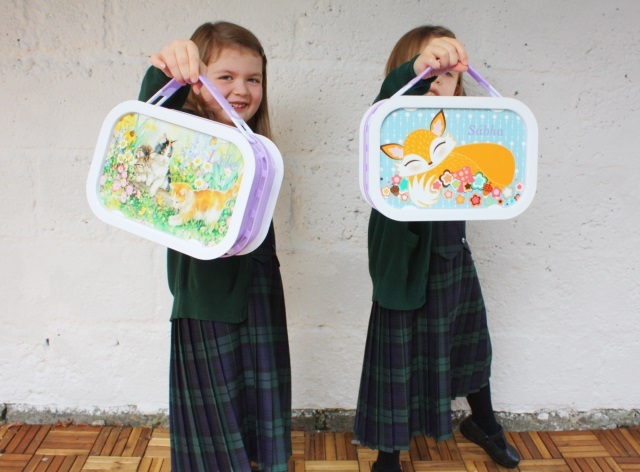 When Zazzle offered us an opportunity to review their Yubo custom-printed lunchboxes I jumped at the chance to get something both practical and fun for my girls - but - when I sat down to try and actually do the choosing, I found I couldn't decide at all! There is A LOT of choice on the Zazzle site and it can be a bit overwhelming if you don't have a definite starting point. In the end, I knew I'd have to leave it to the experts - Lile and Sábha - to decide for themselves what they wanted. To be honest, at first, I thought I might be making a big mistake letting them do that. It could potentially have taken all year for them to come to a decision - but it seems they're fairly good at knowing what they like. They even chose the font for their names! Sábha chose a cute fox design (no surprise there) and customised the background of the image to be blue. She then spent a while deciding which colour looked best for the main body of the lunchbox and eventually settled on purple. After that, we added her name and she asked for that to be made purple too. Lile chose an adorable vintage-style kitten design (no surprise there either) and wanted to match Sábha with the purple body and name so that they could be 'the same but different'. 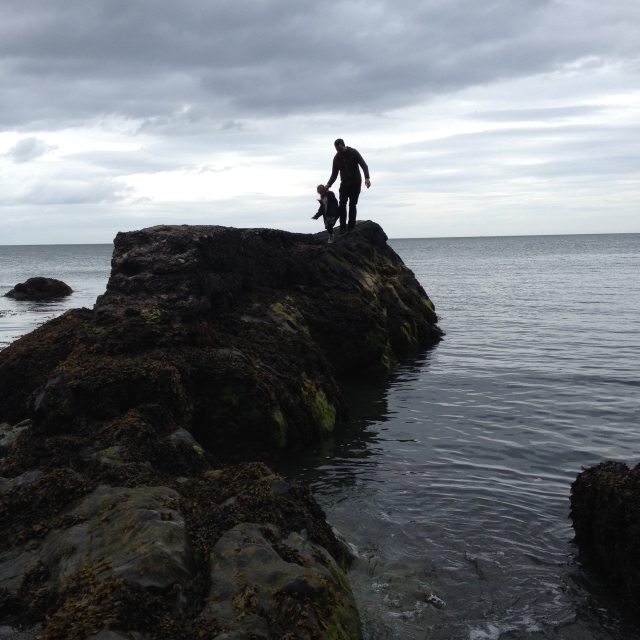 They asked me every single day, for the week it took, if they had arrived yet and jumped for joy when they finally did. I was just as excited to see them too and I have to say I am delighted with them. The lunchboxes include one large (sandwich) container, two small containers and a slim ice pack to keep food fresh until lunchtime. They are BPA-free, phthalate-free, lead-free and 100% recyclable. They are also dishwasher safe. The pictures or 'faceplates' are actually interchangeable and extras can be bought to change the whole look of your lunchbox whenever you like. 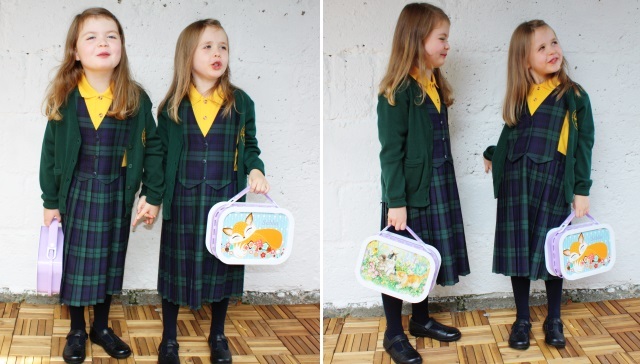 You can even upload an image one of your children has drawn or a favourite photograph to make a completely unique lunchbox that will stand out from the crowd. 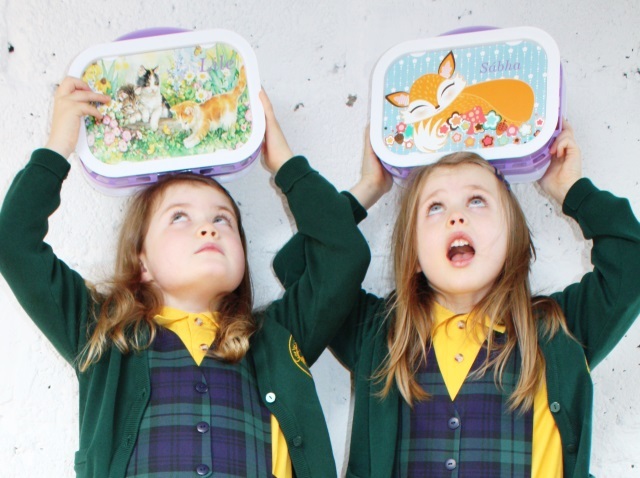 These lunchboxes are not particularly cheap (starting at £32.00 Sterling each) - but they are fantastic quality and will definitely last longer than the 'cheap and cheerful' lunchboxes we have spent a small fortune on over the past couple of years. I have easily spent that amount on a motley collection of lunchboxes that broke after a few months, so I'm delighted to have a quality product that I know will last years. 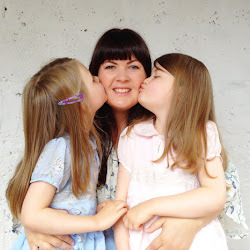 I actually think this is the highlight of starting big school for them! 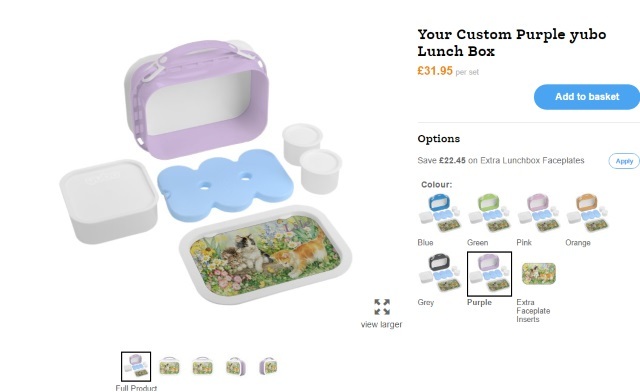 Diclosure: Zazzle provided me with two customised lunchboxes, free of charge, for the purposes of review. All opinions are my own and those of family and we were not paid to give them. thanks Zazzle! They're gorgeous, brilliant idea. Definitely making sure they won't get "mixed up" with other kids lunch boxes! I really love your blog.I wanted to thank you for this great read!! I definitely enjoying each and every little bit of the article and I have bookmarked your site to check out new stuff you post. Listening to the client’s suggestions is very important for this writing service. Every separate client has his or her own views, have a glimpse over here to find more!